Hey! We finally have new ground to cover on Teen Titans #13. When we last left the story, Bob Ratchet's son, Tiny Tom had asked the Teen Titans help him uncover a smuggling ring involving Ratchet's boss, Ebenezer Scrounge. But before the young heroes could get involved, the smugglers were startled by another person in Scrounge's junkyard. The villains fought the shadowy figure, but he beat them up and sent them running for their truck. With no evidence of any wrong-doing, the Titans and Tom decided to follow the stranger instead, who led them to Scrounge's house. The stranger turns out to be Scrounge's old partner, Jacob Farley, who's "as good as dead," because he's escaped from prison and on the run. Apparently, he and Scrounge sold some defective material a while back that got someone hurt. Neither knew that the product was defective, but Scrounge had figured out how to remove any blame from himself and let Farley take the whole fall. Farley wants to murder Scrounge, but the Titans intervene and stop him. Unfortunately, Farley and the Titans are now all trespassing on Scrounge's property, so Scrounge threatens to call the police if they don't leave. Farley flees out a window into the snowy night and the Titans realize that they have no choice but to leave Scrounge alone. Finally, Robin - who was reading A Christmas Carol earlier - makes the connection between Dickens' characters and the names of the people involved in this adventure. He comes up with a plan to "get Scrounge to change his miserable ways." This adaptation is just for fun, so I'm not analyzing it the way I do the others, but there are a couple of things worth noting. 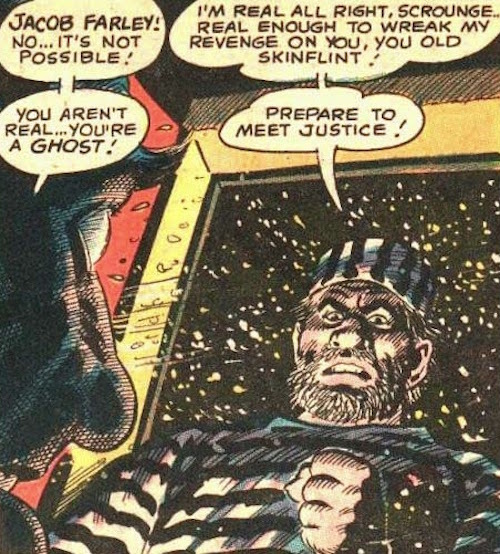 Scrounge is a miserable jerk, but the comic goes out of its way to insist that he's not a real criminal. He rents his junkyard to criminals, but he thinks he's found himself a moral loophole because he doesn't actively participate in the smugglers' activities. That means that he can be redeemed at the end without having to go to prison himself. Farley doesn't really start Scrounge on that path though. All he does is give Robin the final piece he needs to make the Christmas Carol connection. Scrounge is still in complete denial that he's done anything wrong and - as we'll see next year - his attitude towards work and Bob Rachet are as nasty as ever. Interesting how different it is, but also how the writer(s) has Farley leave via window, as Marley does.